What do you think of when you think of food for the Fourth of July? If you said barbecue, you’re among the majority in Texas. But just because you don’t eat meat doesn’t mean you can’t enjoy a day with friends. Of course, the standard hot dog, chicken and hamburger replacements are top of the list for fitting in at a party. Actually, any of the non-breaded frozen meat replacements work wonderfully on the grill. Of those, we love Smart Dogs and Tofu Pups, which both grill nicely, and the soy Boca patties for burgers. Or, if you prefer to make your own patties, About.com has a list of some pretty interesting burger recipes. Slap the BBQ sauce – the real magic of a Texas barbecue – on any readily available meat substitute and you might be the only one who realizes you’re eating a vegetarian meal. But meat substitutes aren’t the only way to enjoy using the grill. Large or cut vegetables are amazing and light enough to keep you upright through the heat of the afternoon. Toss a portabella cap on the heat and dress it up for a juicy burger alternative. Or skewer some summer squash, onions, peppers, fruits and whatever else you have on hand for something even the carnivores will love. Vegetable skewers cook up fast, so squeeze some fresh lemon over them and put them to the fire toward the end of the grilling cycle. Although many of those listed are not inherently vegetarian, Kelly Worthington-Hardy has a beautiful Pinterest page for red, white and blue food. Any of the gelatin deserts can be reworked with agar agar, and Newport Flavors and Fragrances makes some vegan food coloring options. It may take a little planning, but making festive take-alongs can be downright easy if that’s what you want. If you are more “old fashioned” with your snacks (which we tend to be), try simple deviled eggs – add pickles or celery for increased texture – and ants on a log. They may not fall into the new expected colors, but they’ve been around since the dawn of entertaining for a reason. Or maybe something along the lines of lemonade or a summer punch are more your speed? A little beet sugar and a bag of fresh fruit to juice goes a long way on a hot summer afternoon around here. The point is, if you are celebrating America’s independence with friends and family this Wednesday, you shouldn’t have to work harder finding something to eat or serve than you do deciding where to spend the day. Spend your time enjoying each other’s company and cook up some of the many vegetarian options that are becoming more readily available every day. Candy, wine, jewelry, flowers. What do all of these things have in common? They are all better received Mother’s Day gifts than any form of kitchen appliance. That’s right kids; mom doesn’t want a new tool to help her wait on you faster. Well, maybe she wants the tool, but not on Mother’s Day, which will be here next Sunday. On a day named after her, let’s go the “we appreciate you” route. So how do we show appreciation? You know your mother (or grandmother, mother-in-law, sister who raised you, woman raising your kids, etc.) well enough to know what you share that makes your relationship unique. Whether she is a fragile flower or a prickly pear, something bonds you to her and that’s what will mean the most next weekend. Does your mom run? Maybe you can find a short race to enter together. There are Mother’s Day runs all over the map. Or, if entrance fees are too high this year, plan a new route and run it together. Maybe you are like us and in no shape to take on that eight-minute mile. That’s OK. We have dinner, a movie, or, with Studio Movie Grill, dinner-in-a-movie options around here. Fair warning, though: chick flicks tend to sell out fast, so unless you share a love of sci-fi or horror, arrive early. If you live out of state, flowers and a card are always appreciated. But if your mom is allergic to flowers, think about her personality. Would a donation to a shelter where she volunteers be more appropriate? Maybe pictures from someplace you went together? And let’s not forget the simple phone call. Many of us who spend the week on the phone with clients or setting up business meetings might not think twice about making a call. But for someone who hasn’t seen the person she raised in a while, that call might be the highlight of her day. And it might turn out to be the highlight of yours as well. All of this is not to say that a nice charm for her bracelet and breakfast in bed are not enough. Either one of those is wonderful on its own if that’s the kind of relationship you share. The point is not to “throw money at it,” as one friend says. This is your chance show appreciation for the person (or people) you consider mom, no matter how unconventional that relationship may seem. Well, it’s Easter Sunday. Depending on your traditions, your family may have lamb, or ham, or, if you’re lucky, a Tofurkey roast or Field Roast for the vegetarians. Did you know that the lamb tradition comes from the Passover sacrifice to ensure the angel of God would not harm inhabitants of the house? Or, in the U.S., the ham tradition started because the pigs not quickly consumed after the fall slaughter had to be cured, which took so long they were ready about the time Easter rolled around? Pretty interesting stuff on About.com, huh? Whatever the tradition, if you celebrate Easter, there’s a good chance you’ll see hard-boiled eggs and candy nearby. Aside from eating deviled eggs, egg salad, and hard-boiled snacks every meal for the next week, eggs don’t really interfere with the vegetarian style here. (Of course, if you are vegetarian for religious reasons, skip the eggs.) And candy, all that sugary sweetness – who can resist a heaping basket of Easter candy? Maybe it’ll add a pound or help accelerate that cavity forming, but what else could sugar really do? Well, if you live a vegetarian lifestyle, some candy could hurt your meat-free existence. For instance, did you know that most marshmallows contain gelatin? Not all of them, of course, but the standard way to make a marshmallow requires gelatin. Sweet and Sara offers a vegan alternative in multiple flavors. Check the refrigerated section of your local Whole Foods. If you would like to avoid gelatin, try Cadbury Mini Eggs, Whoppers Robin Eggs, or Cadbury Crème Egg. But the Crème eggs do contain powdered egg whites, so if you don’t eat actual eggs, these are probably not for you. Another interesting tidbit about candy: “natural flavors,” particularly those in the vanilla line, could come from beaver secretions. Apparently the FDA doesn’t distinguish between vanilla plants and beavers, but if you prefer one to the other, you might have to do some research. Honestly, natural flavors could contain anything remotely considered natural, be it animal, vegetable, mineral, according to the oh-so-broad description. And the bug crushing for red dye is nothing new, right? Jaime Oliver even did an entire segment on it once. But wait, there’s more! Was that sweet treat made from processed sugar? The kind processed on cow’s bones? Basically, if we are eating candy (and we definitely are around here so you’re not alone), there’s a good chance we’re eating something we wouldn’t otherwise choose. Unless, that is, we seek out vegan alternatives. As always, we don’t judge. We’re about learning what we can and spreading the information as far as it will go. As long as you are making educated decisions with which you are happy, enjoy your experiences. And heck, you could even share your little-known secrets with us from time to time. It's not too late to get those chocolates, and the bears are out of sticky fingers range. 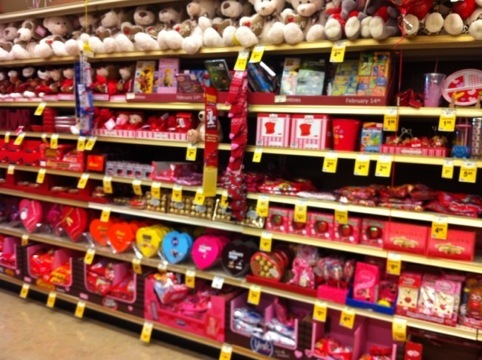 You know it’s Valentine’s Day when the holiday isle at the grocery store runs red with heart-shaped boxes. But give us Theo chocolates over the soy lecithin masses any day. Available at several specialty stores, these chocolates are perhaps the best we’ve had. On a tour of the factory several years ago, we learned that the business operates on fair trade principles and produces certified organic chocolates. Sugar and good karma? You can’t beat that with a stick. The modern Second Floor lists several vegetarian options on its dinner menu and possibly one of the most interesting salad menus around. Pickled beet with watercress and goat cheese? Even if we have to leave off the profiterole, we say yes please. Of course we don’t encourage limiting yourself to salads, but these look to be great starts. A French restaurant with a long family culinary history, Cadot has put together a special menu for Valentine’s Day. While this menu does not list vegetarian options, a prompt reply to an e-mail inquiry confirmed that, “Yes, you can order a vegetarian entree on Valentine’s Day. Just ask your waiter.” The standard dinner menu offers two options in the dedicated vegetarian section, and several of the salads appear easily modified to fit dietary needs. We’re not going to say that all Italian restaurants are the same, but, while wonderful, they are always iffy for vegetarians. We’re partial to a couple of neighborhood places in the suburbs, but Lucia may be more your style. With so many great choices in the Metroplex, be sure the marinara doesn’t include a little beef broth and there is no chicken broth in the cream sauce if that is your preference. Often, Italian restaurants offer two tomato-based sauce options, one vegetarian and one not, so asking the server will ensure you get the one you want. And pairing bruschetta with caprese salad and a little candlelight goes a long way toward a romantic evening. 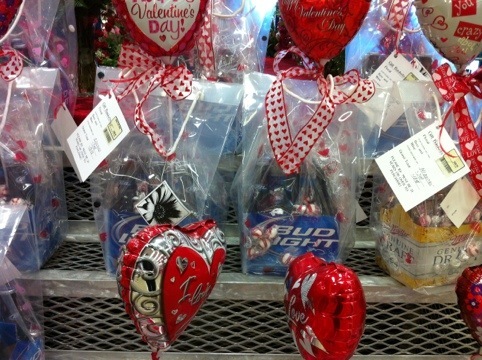 Apparently, nothing says, “I love you!” in Texas like a balloon and a six pack. Grab a wicker basket, fill it with a couple of #19s with avocado from Great Outdoors, some preserves, crackers, wine and a warm blanket, and take your partner to the Dallas Arboretum. Use a table on the patio or find a nice lake-facing slope to sit and share lunch. Papa Murphy’s has a pretty good gourmet vegetarian pizza, and maybe they’d even let you alter the meaty “Heartbaker” they’re advertising this week. Either way, this is a good chance to spend a quiet evening with your partner. Stay at home, get a fire going and maybe find a nice romance on Netflix and you’ve got everything you could have going out, only in a more intimate setting. Maybe the dinner and a movie route is just not your thing. If you’re like us, and go out for dinner several times a week, the excitement isn’t in the destination, but in the experience. If this the case, trying something completely different could be fun. Spend an hour on the trampolines at Cosmic Jump in Allen, or get up close and personal with a kickboxing class at Octagon in Uptown. Climb on at a local rock wall or start that SCUBA class you’ve talked about for so long. As long as you share a common interest, you can have fun and strengthen your relationship bonds this Tuesday. Just be creative and you’ll find a way to spend quality time with your partner.